Mahindra Truck and Bus : Indian Truck Drivers: Do they drive in Peace? Road Transportation is one of the major channels that accelerates the productivity and economic development of our country. It also plays a vital role in bringing about the progress of isolated districts by introducing them to trade and incorporating them into the mainstream economy. In spite of its major significance to the transport division in the country, it has received negligible consideration. The absence of a favorable transportation infrastructure and the shortage of finance from the administration has been the root problem challenging the road cargo sector. There are about 5 million truck drivers in the country who contribute to keep the economy moving but have to put up with tragic living conditions. They do not have access to proper places to rest and have to submit to long queues at checkpoints. Overloading – The truck managers overload the trucks to save capital as transportation costs increase if the trucks carry only the permissible load. However the Government has recently issued a ban on overloading and this problem will soon be solved. Absence of Rest Rooms and Toilets for Drivers – Basic facilities of rest rooms and toilets are not provided by the authorities for these drivers. They wait for days to get loaded or unloaded at factory gates, yet simple amenities like these are not made available to them. They resort to bathing on the road and eat unhealthy roadside food which takes a toll on their health. Timely Checks on Trucks - Trucks should be checked for the proper functioning of headlights, brake-lights, indicators and reflective triangles. Only trucks with equipment in sound working order should be made permissible for use by the authorities to prevent accidents on the highway. Training for Drivers - Training institutes have been set up to train drivers for safe and cautious driving habits. Mahindra Navistar has set up various training points to train the drivers for effective driving in order to conserve fuel. The problems faced by this division are diverse and the issues require multiple solutions. The Government is taking steps to restructure the road transport sector. 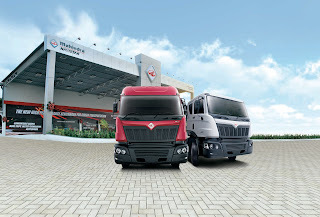 Mahindra Navistar has already initiated the development project by introducing efficient trucks and training institutes which provide proper training to the truck drivers. The Government too is taking an initiative towards the better development of the highways for hassle-free transportation.